We are now welcoming applications to join our team. We have LAT Emergency Medicine posts available. Exciting opportunity to join the ED Nurse Practitioner team! 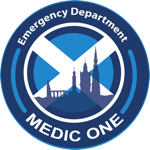 We're looking for Emergency Nurse Practitioners to join the NHS Lothian EM team. Clinical Development Fellowships with NHS Lothian. Join the ED team! A Clinical Development Fellowship gives the unique opportunity to test out a specialty (including EM!) before signing up to training. The CDF posts offer experience over 12 months in a range of Acute Clinical Specialties including Emergency Medicine, Surgery, Trauma and Orthopaedics and Acute Medicine that may be of interest or support a future career plan. In combination with the clinical component each CDF will be assigned (under discussion) to an area of developmental interest in Clinical Education, Simulation & Skills training, Quality Improvement, Research and Development, Leadership and Management or Informatics. Follow the link for details.....and join team ED! Consultant recruitment- Join the EDvolution! A new Consultant post based at RIE is currently advertised. Come and join the ED team! We are now recruiting to our new Trauma Fellow posts. We are currently recruiting Emergency Medicine consultants. We are currently recruiting a number of LAT posts. Clinical Development Fellow applications now open for August 2014. Click here to go straight to the recruitment site.